JP:3D MERCHANDISE ALSO COMING TO BURGER KING! We have received word that Burger King will also add a little something (hopefully toys!) to their kids meals for JP:3D. It seems that Burger King keeps up their tradition with JP, so keep a close eye on them! Also check out their homepage for the Jurassic Park announcement! 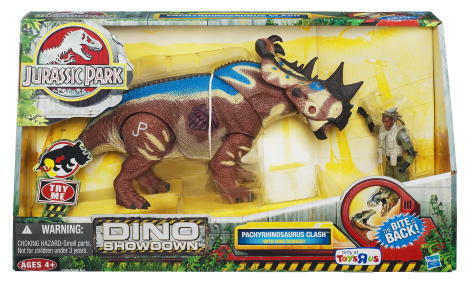 Also in other news, JP:3D toys by Hasbro have been found in a Toys "R" Us in Malaysia! Does this mean they are not entirely North America exclusive? Check your local Toys "R" Us and let us know if you found anything! JP:3D Toys are out! Or... are they? 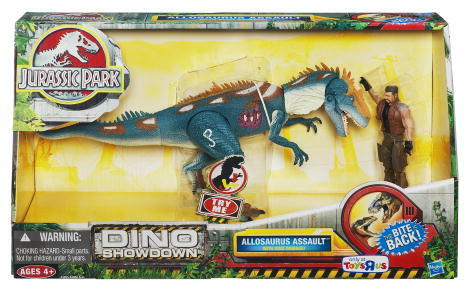 A confusing day for the Jurassic Park toys fans. After contacting Toys "R" Us and Hasbro several times, our members learned that TODAY is the release day of the new JP:3D line. Toys "R" Us personnel has been telling fans that it will probably arrive with the next truck shipment, which so far has not been the case, as well as their distribution centers are rumored not to have any Jurassic Park stock at the moment... and while Hasbro doesn't know the release date, they did give us some information on the Pachyrhinosaurus: The Dinosaur is brown with tan and blue and a few other colors (sounds like JP2009) and comes with a human figure that is articulated, he is wearing a hat and comes with a machine gun (Jurassic Joes?). The description talked about a showdown between the human and dino. The Pachyrhino has a head ramming action if you pull back one if its legs! So when will we finally get to buy them? We don't know. But chances are it's soon, so keep a very close eye on your local Toys "R" Us. Special thanks to all forum members who have contacted Hasbro/Toys "R" Us to provide us with information.